The editor of the Economist in the 1950's (Geoffrey Crowther) famously advised young journalists to "simplify, then exaggerate". It appears politicians in general - and the SNP in particular - have embraced this principle and refined it by adding the coda "... and carry on regardless". Readers of this blog will be familiar with the example of Alex Salmond's "We'd have been £8bn better off over the last 5 years" trope - repeated ad nauseam long after it had been shown to be complete nonsense. If you missed it I cover the detail of that calumny here > Alex Salmond's Shameless £8bn Lie. Another striking example is the SNP's resolute refusal to acknowledge the 2012-13 Government Expenditure & Revenue Scotland (GERS) numbers published in March 2014 (6 months before the Referendum). Those figures didn't fit their chosen narrative and their response was so brazen as to be almost admirable - they just kept quoting the old figures instead. In fact this "carry on regardless" approach served them so well that they still maintain it even now, 11 months after the "new" figures were published. @kevverage Scotland's per capita deficit lower than UK;s. Success from moving money to capital investment. Well now: that "per capita deficit lower than UK's" statement is demonstrably false. The table below summarises the only figures you need to know to follow this. They are direct from GERS (published in March 2014) and are completely uncontroversial; if you don't trust me see Footnote 2. As anybody who's been paying any attention knows, Scotland's deficit per capita (of course including our geographic share of oil revenue) was about £500 worse than the rest of the UK in the most recent year's stats. In fact it's been worse in three of the last four years. It's probably also worth mentioning that these figures are of course before the crash in oil price; as I've discussed here there is little doubt that our deficit per capita will have deteriorated even further versus the rest of the UK as a result. That's not an observation I take great pleasure in; it's an unfortunate truth. @zsstevens @Shinsei1967 @Haitch7 And spend £1,200 per cap higher too. Come on: we're not idiots. So we'd had this exchange; he'd assumed he could bluff his way through and was caught out; the actual data was clearly highlighted for him. And yet today he goes and repeats the same falsehood. It's almost as if he doesn't really care about the facts. In fact a quick search reveals his consistent willingness to assert facts that are contrary to published data: these two tweets are from August 2014, 5 months after the GERS figures above were published. This was in the heat of the indyref battle when surely all politicians were closely attuned to the figures on our economy? Do we seriously think he was misrepresenting this data by accident? 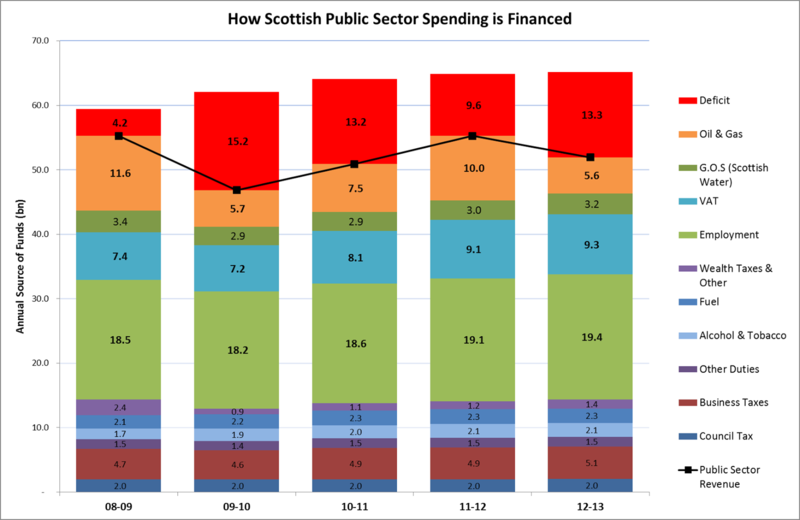 @iainmacwhirter @GordonMccaskill Deficit certainly illuminates failure of UK. Scotland's would, even worst case, be lower per capita. I particularly like his use of the phrase "even worst case"; to adopt that authoritative tone when you have such a loose grasp of the data demonstrates remarkable chutzpah - and not in a good way. You might think he just has an unfortunate habit of making demonstrably false statements and failing to learn from his mistakes; but if that were the case how would he keep getting re-elected? Of course the truth is more depressing and frankly more sinister than that. These Tweets are symptomatic of a wider malaise. Mr Stevenson is just one of many politicians (and campaigners like the odious Wings Over Scotland) who have discovered the effectiveness of choosing a few simple lies and sticking with them regardless of the facts. They've realised you don't have to be burdened by telling the truth; if you, your colleagues and your acolytes repeat a lie often enough it will penetrate the public consciousness, be simply accepted as a matter of fact. Something needs to change. If you're not angered and outraged by elected representatives behaving in this way then you should be. If we've reached the stage where we just blithely shrug and accept that politicians are willing to lie when it suits their purposes then - well - then we get the politicians we deserve. @kevverage @murdo_fraser Wrong again - Page 14 in Wee Blue Book has necessary references including A Darling. So in response to a post clearly highlighting and sourcing figures via GERS an SNP MSP cites the Wee Blue Book (as published by the notorious Cybernat Wings Over Scotland). Of course the Wee Blue Book uses 2011-12 numbers despite the fact 2012-13 numbers were available 5 months before it was published (and as I show above the two preceding years also show us running a worse deficit). It would be hard to imagine a more striking demonstration of precisely the behaviour I am highlighting in this post. 1. Stewart was elected to the Scottish Parliament in 2001. Between 2007 and 2012 he held the post of Minister for Transport, Infrastructure & Climate Change and - according to Wikipedia - when he was elected as the SNP member for Banffshire and Buchan Coast in 2011 "His 16,812 votes represents the largest share of votes cast in a Scottish Parliament constituency with 67.24%"
One of the unfortunate legacies of the Independence Referendum is that all subsequent attempts to constructively debate Scottish politics - and the economic choices we face - are rapidly hijacked by those who believe the only question that counts is: should we be independent: Yes or No? That's unfortunate because one of the major positives of the Referendum should be that as well as being more politically engaged, many of us are also far more economically informed. Why don't we capitalise on this improved understanding of our economic challenges and move the debate forward beyond simplistic Yes/No questions? Why can't we make ourselves better voters by actually thinking about the difficult choices our elected representatives face without getting bogged down with worrying about whether they sit in Westminster or Holyrood? Hopefully we can frame the discussion with some uncontroversial statements that most rational observers agree with. Consistently higher levels of government expenditure in Scotland are offset by higher tax revenues only because of oil - at least from a deficit per capita perspective we can't consider oil to be "only a bonus"
What currency would we have used and with what fiscal strings attached? Would we have needed our own currency and if so what would it have costed us to establish it? To what extent would our hugely important trading relationship with the rest of the UK have been damaged by independence and what would the implications for employment in Scotland have been? Would our relationship with the EU have been jeopardised/weakened or actually saved/strengthened by independence? Whether your objective is to make a better economic case for independence (or maybe full fiscal autonomy) or simply to strengthen Scotland's contribution to the UK, our reliance on oil revenue has to be addressed. It's obvious that we should maximise the value our economy generates from this natural resource so we need to strike a careful balance between the tax burden we place on North Sea operators and the relief we offer them when the global oil price slumps. In this regard the UK and Scottish objectives are of course completely aligned - it should "simply" be about finding the right balance between taxing and supporting the industry. In essence the challenge is simple: the only way we can reduce our reliance on oil is to generate more tax revenues from elsewhere or to spend less public money. The alternative is to hope that oil "does it for us" which - to me at least - doesn't sound like a particularly robust economic strategy. Let me reintroduce my 2012-13 GERS revenue & cost flow chart (detailed workings here > Scotland's Economy); hopefully this can help us at least get our heads around the main dynamics we have to consider, the economic levers we have to play with. 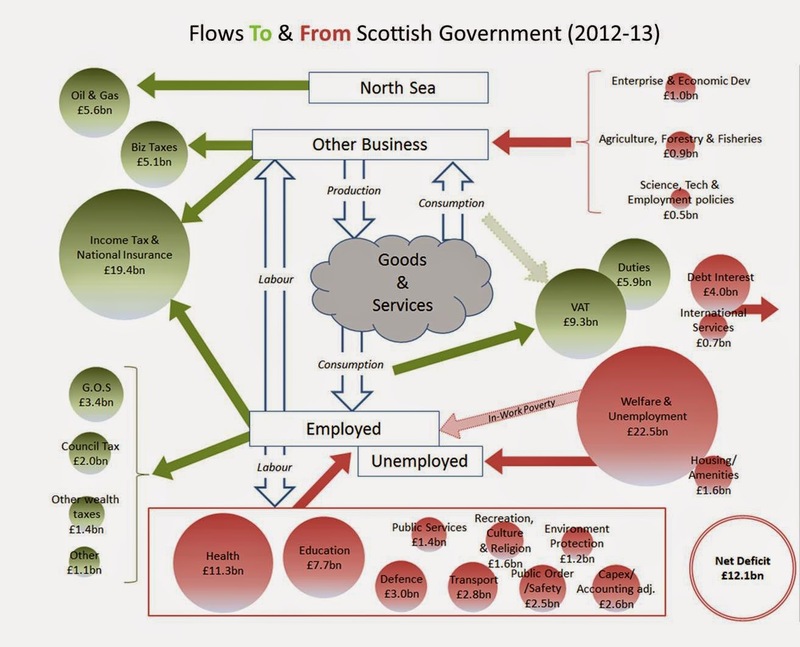 Revenues generated in Scotland are shown in Green, Scottish public expenditure made in red. The net effect is that in 2012-13 we generated a £12.1bn deficit (i.e. £12.1bn more was spent* in Scotland than generated* in Scotland). 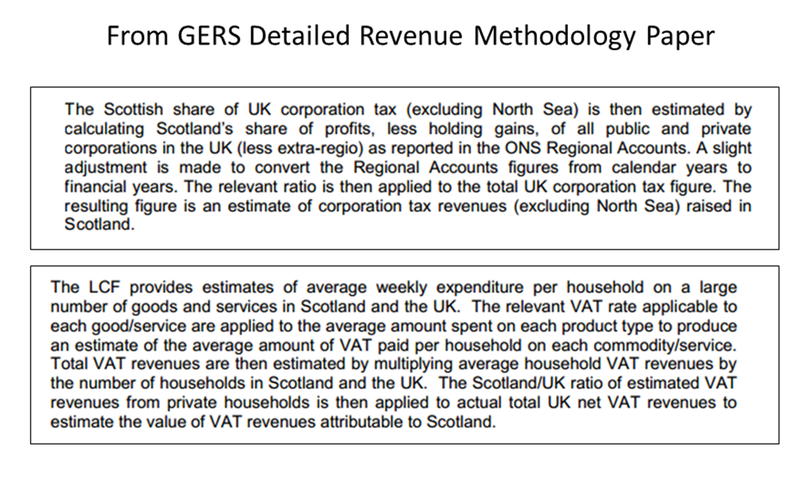 If you doubt this figure comes directly from Scottish Government GERS or if you have concerns about the nature of the GERS methodology I refer you to the footnotes at the bottom of this post. We know things will have got >£3bn worse since these figures were produced due to the oil price crash - so in 2014-15 we are likely looking at a deficit of >£15bn (or >£2,800 per capita). In the spirit of this post I would argue that whether you believe we should be independent or not you should have a view as to how that deficit can be eliminated (or at least materially reduced). Let's not distract ourselves at this stage with who holds the levers - let's think about what (from a Scottish perspective) we might want done with them. So how can we raise more tax revenue or where should we reduce expenditure to find the £15bn pa. or so we need for Scotland (either independently or contributing as part of the UK) to be running a surplus (i.e. for us to be able to start reducing our debt burden)? We need to grow the green bubbles and/or shrink the red ones - let's consider how. By far and away the biggest source of government revenues are employment taxes at £19.4bn: this in turn is obviously a function of how many people are employed, how much they are paid and the tax regime in place. The electorate is highly attuned to tax rates: they affect us directly and we can easily work out whether a tax rate or threshold change would impact us personally. Years of campaigning and polling have taught political parties to be wary of explicitly suggesting personal tax increases. It's worth noting the ICAS Report which observed that for Scotland "even if there are no behavioural changes [...] another 10% on the top rate of tax might raise maybe £240m". The implication is clear: to have a material impact on the deficit though income taxation requires addressing tax rates of those on middle incomes. As a scaling factor here: if we all paid 5% more tax (and NI) this would generate about £1bn. It's kind of obvious that reducing unemployment not only reduces the welfare burden on the state but also increases the tax revenues generated through employment taxes. 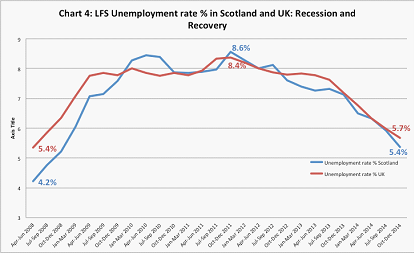 Without getting bogged down in definitions of employment and unemployment (e.g impacts of part-time work and those not actively seeking work) we can observe the headline unemployment rate in Scotland is 5.7% (very similar to rUK). A halving of the unemployment rate would therefore add roughly 2.35% to the current employment rate of 73.2% = 2.35/73.2 = a 3.2% increase in working population. If we take the highly (ludicrously?) optimistic assumption that these jobs would be at average wage levels this would increase employment tax generation by £0.6bn (3.2% of £19.4bn). Of course this should remove some people from welfare which we need to consider when we look at the cost side of the equation. 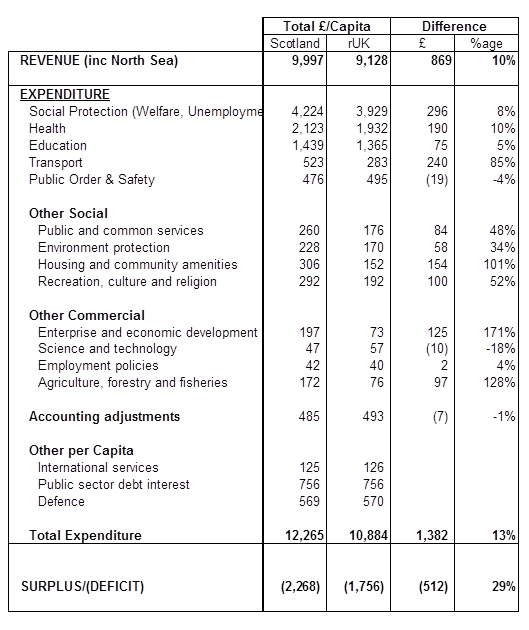 So what do we conclude on Employment Taxes? As context: over the last 5 years the nominal increase in Scottish employment tax revenues has been 4.6% - over that same period the Consumer Price Index increased by over 14%. I'd suggest that you'd have to be pretty optimistic about employment rates and wage inflation (even fuelled by a NMW increase) to generate more than £0.5bn of extra revenue (in real terms) before you have to simply start taxing middle earners more. Of course economic growth (such that tax revenues increase faster than public spending) is the other way out of this trap - hold that thought. If you look at the size of the consumption taxes (VAT £9.3bn and Duties at £5.9bn) it's obvious why these are to "go to" place for politicians seeking a quick fix. Assuming (simplistically of course) that consumption patterns wouldn't change a drop of VAT from 20% to 15% would lose us £2.3bn or of course an increase of the basic VAT rate to 25% would gain us £2.3bn. Of course as with any tax increase the fear is that it leads to a reduction in consumption and potentially slows or stalls economic growth. You can't get something for nothing. Similar arguments of course apply to duties with Fuel, Tobacco and Alcohol being the biggies. Business Taxes of £5.1bn are made up of corporation tax £2.9bn and Non-Domestic rates of £2.0bn. It's worth noting that corporation tax is one of the most uncertain GERS figures because nobody knows how much profit companies would report in Scotland as opposed to rUK - in fact HMRC estimate this number as nearer £2.5bn in 12-13. There has been much talk about tax avoidance (about which more below) but I haven't heard many arguing for a higher corporation tax burden. It's worth highlighting that retained (post tax) corporation tax profits are what pay dividends; dividends (in the long run) drive share prices; dividends and share appreciation is how investors make returns; pension funds are the largest investors ... so controlling corporation tax is not just about incentivising business investment, employment and economic growth it's also about protecting the value of pensions. Which is of course why economic growth is the key - so let's scale this. Non-Oil revenues for Scotland were £47.5bn in 2012-13 so to close our £15bn (post oil crash) deficit we need 15/47.5 = 31% real revenue growth (that is growth in tax income above growth in public expenditure). If we look at historic UK real annual GDP growth rates (using e.g World Bank data) we can see that the best average annual rate we've achieved over a 5 period in the last 20 years was 1.9% pa in the period 1990-1995. 14 years of that would get us there. This is of course why amid all the talk of austerity there is a clear understanding from all parties that economic growth is the golden key here - austerity that damages long-run growth is counter-productive . Of course all of the above has looked only at the revenue side. What choices do we face on the cost side (the red bubbles)? Our total expenditure was £65.2bn in 2012-13 so to get our £15bn through cost-cutting we need to reduce all expenditure by 23%. Tricky. Scotland's defence "bill" in 2012-13 was £3.0bn. The NATO member state target spend level on defence is 2% of GDP. In Scotland's case in 2012-13 that would imply a spend of £2.9bn. Some of the numbers that are loosely thrown around as savings from dumping Trident are extremely misleading (e.g. lifetime investment costs as opposed to Scotland's share of the annual cost). There's an interesting debate to be had about spending on Trident or alternatives (as the Centre Forum cover here) - but people who think scrapping Trident is an economic fix are - assuming we are serious about remaining in NATO - wide of the mark. Let me declare an interest: the NHS saved my life when I had cancer and my wife works for the NHS. Perhaps its not surprising then that for me - as for so many - our health service is somewhat of a sacred cow when it comes to cost-cutting conversations. Of course in Scotland we have free prescriptions for all and we are a relatively unhealthy lot (we generate £95 more tobacco and alcohol duty per capita than the rest of the UK) - this may in part explain why we spend £190/capita more on health than the rest of the UK. If we closed that health spend gap with the rest of the UK it would save us 10% of our health budget or £1bn. Good luck to the political party who propose that. At £22.5bn this is clearly the dominant contributor to public spend. Unemployment is clearly a factor here but not the main driver. The chart below (from Prof Brian Ashcroft's Economy Watch) shows that unemployment rates are not high by historical standards and are falling (with Scotland very closely mirroring the UK as a whole). The issue of in-work-poverty would appear to be a bigger concern - the Joseph Rowntree Foundation estimate that 21% of UK households live in poverty There are clearly a significant number of people in low paid employment whose households are recipients of benefits. This is a huge and complex topic I won't attempt to cover here - but suffice to say the topic of National Minimum Wage must be one of the factors to consider in this debate. Frankly when you look at the other cost areas and you consider how we might find £bn's of cost savings it gets pretty tricky. I'm running out of steam for now so I'll leave it for you to look at the remaining red bubbles and think about it! I guess the overall conclusion once you've ploughed through all of this is not surprising - we can find maybe a billion or two by tweaking our tax and spend policies but the deficit will not be closed without either eye-wateringly severe austerity measures (hammering the masses with taxes and or slashing health & welfare expenditure) or a return to sustained long-term real economic growth. But whilst it's easy to say austerity measures that threaten growth are to be avoided, I'd suggest it's equally important to observe that simply loosening our belts in the hope that economic growth will naturally follow is not a good enough strategy. So what are the specific actions we can take to stimulate sustainable economic growth? Feels to me like a subject for a future blog post. The SNP appear hell bent on pushing for Full Fiscal Autonomy (FFA) for Scotland and with possible Westminster coalition deals to be done this may be closer to reality than many think. So here's a quick summary of the realities of Scotland's finances as presented in the Government Expenditure & Revenue Scotland (GERS) figures. These figures are produced by the Scottish Government and I show the numbers here assuming we Scots get to keep "our" oil & gas revenue. I'm not trying to make any political point and will try to avoid revisiting old independence referendum arguments. My intention is merely to inform the debate, help the intellectually curious consider the implications of Full Fiscal Autonomy and - perhaps more constructively - help us all think about how our national economy works and what choices our elected representatives face. 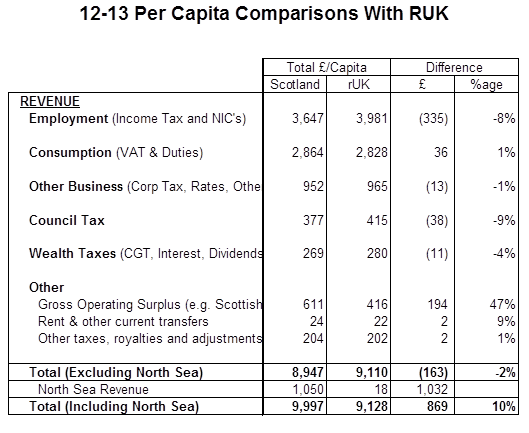 All the figures here are most recent (2012-13) GERS figures quoted on a per cap (i.e. per person) basis. I often see Scottish figures compared to UK (including Scotland) which can lead to confusion - so the comparisons I use here are between the Scottish figures and the "Rest of the UK" (rUK) where rUK = UK - Scotland (which I think is less confusing). 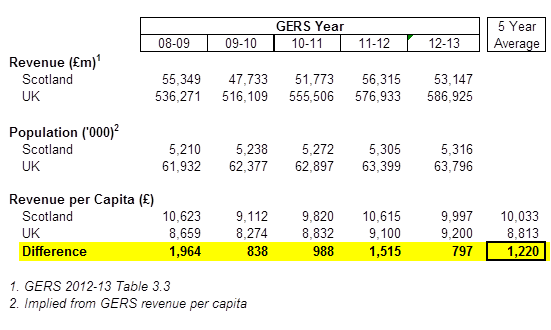 Revenues from employment taxes (i.e. income tax and National Insurance contributions) are -£335/cap or 8% lower in Scotland. Given unemployment rates are almost identical, this simply reflects Scotland's lower average salary levels. Revenues from non-North Sea business taxes (corporation tax, business rates and other levies but excluding employer NIC's, VAT, fuel duty etc. 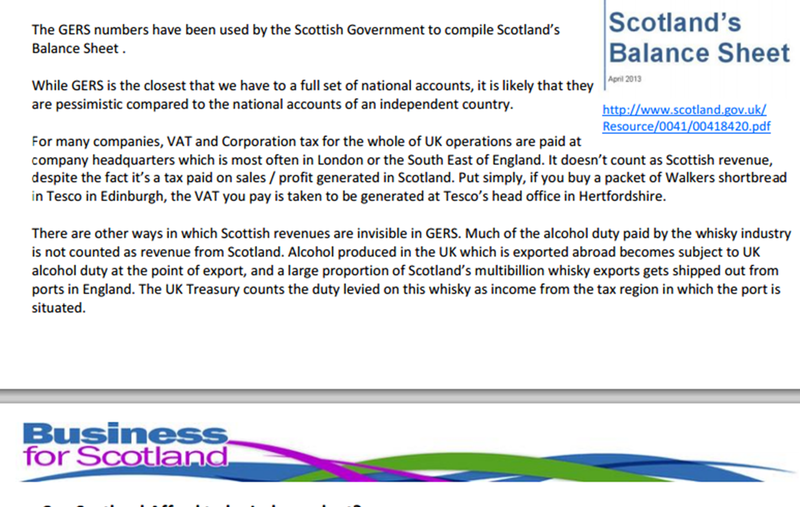 already included above) are only -£13/cap or 1% lower in Scotland. Council Tax revenues are -£38/cap or 9% lower in Scotland (where we have of course had a council tax freeze). 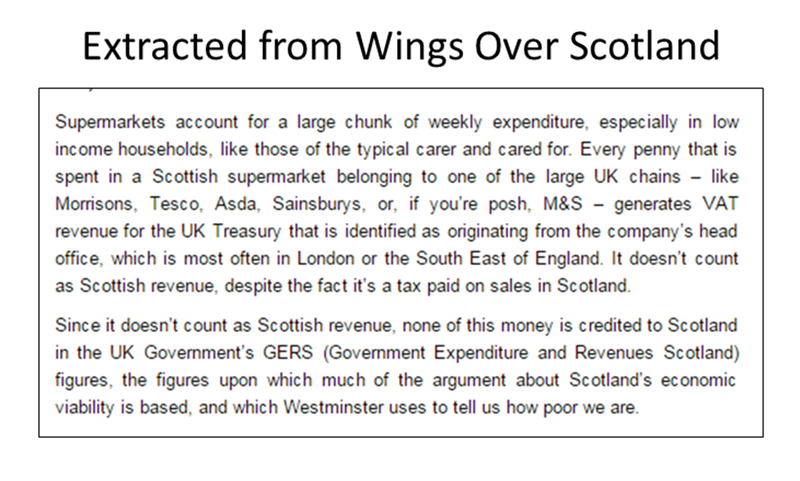 Revenues from other wealth taxes (Capital Gains, Interest and Dividends) are only -£11/cap or 4% lower in Scotland. 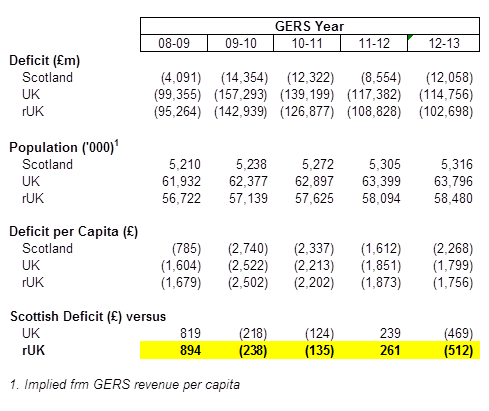 Profits generated by publicly owned assets appear in National accounts as Gross Operating Surplus (G.O.S.). Mainly because Scottish Water remains in public ownership, G.O.S is +£194 or 47% higher in Scotland. The sum of all the above largely explains why (before North Sea revenues are considered) Scotland raised -£163/cap or 2% less revenue than rUK in 2012-13. 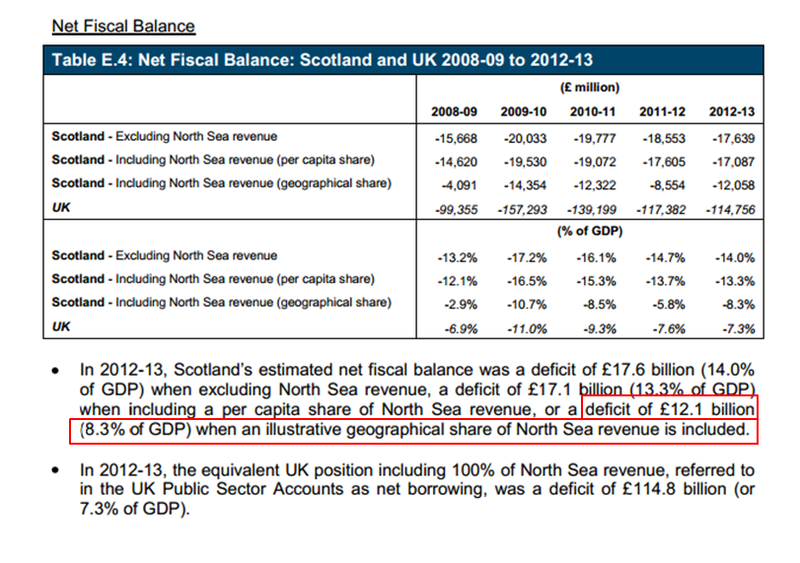 The relative significance of North Sea revenue to Scotland's finances is clear. 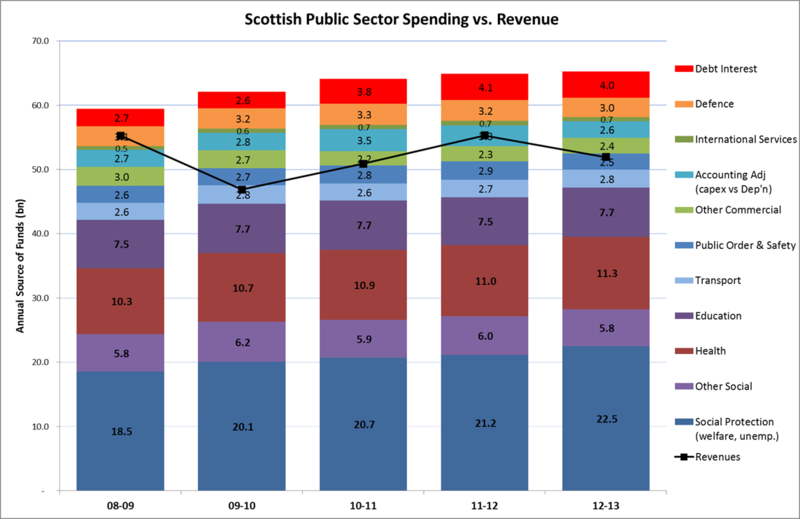 In 2012-13 these revenues represented 10.5% of Scotland's Public Sector Revenue (1.1% of the UK's). 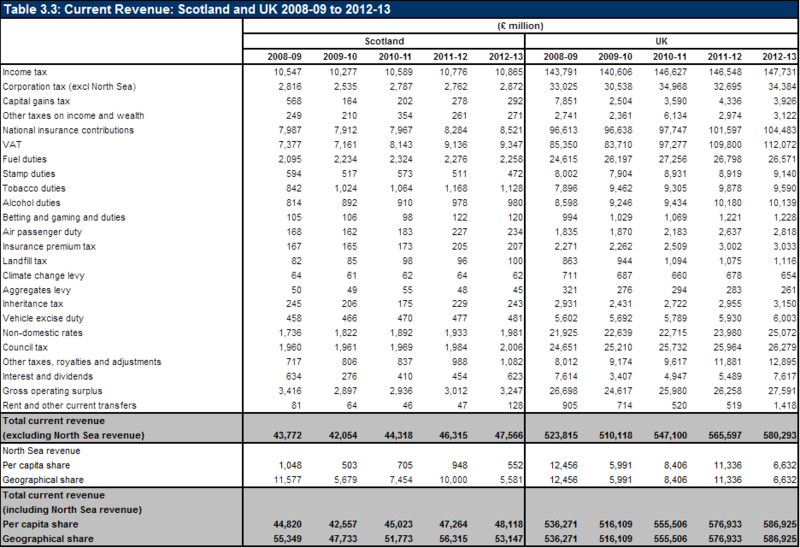 In 2008-09 North Sea revenue was 20.9% of Scotland's Public Sector Revenue (2.4% of the UK's). 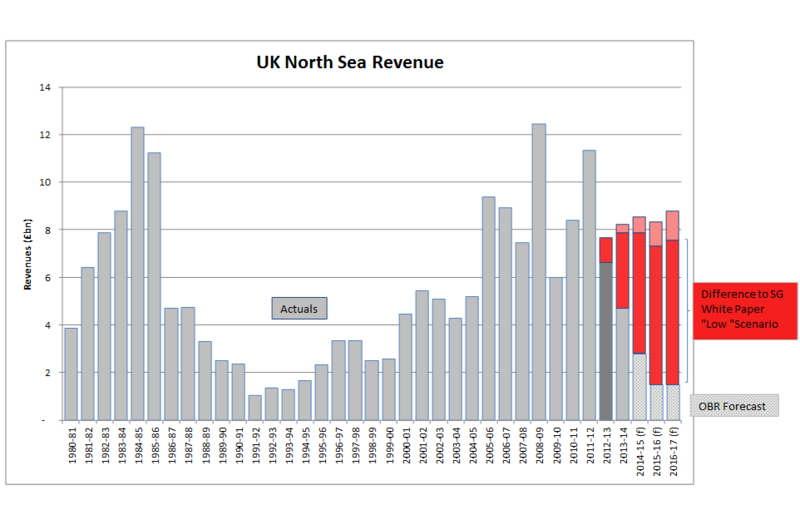 To put this 2012-13 figure into context let's look at North Sea Revenues over time. The figures below are total North Sea revenues (of which Scotland's geographic share ranges from 95% to 84% over the last 4 years). The dark grey bar is 2012-13; 2013-14 is now known (although full GERS accounts are yet to be published) and the OBR forecast for 2014-15 can be expected to be pretty accurate given we are now in Feb 2015. The dark red bar is the - ahem - "low" scenario used in the Independence White Paper (the lighter red the "high" scenario). In absolute terms Scotland's North Sea revenues in 2012-13 were £5.6bn (£1.3bn below the White Paper figures) and we now know that by 2014-15 they will be around £2.4bn (£4.7bn below the White Paper low scenario). We therefore already know that on oil & gas alone Scotland will be about £3.2bn worse off in 2014-15 than we were in 2012-13 (that's about £600/cap). There is (sensible) talk of reducing the taxation burden on North Sea companies in response to the oil price slump. This may help save jobs - but again the North Sea tax revenue generated per barrel will of course be lower. Of course with the figure above this still means we'll be generating more public sector revenue per capita than the rest of the UK to the tune of about £250/cap in 2014-15. I guess that's what the SNP mean when they refer to oil & gas as merely a bonus. As long as we don't spend considerably more than the rest of the UK we shouldn't be any worse off as a fiscally autonomous country - so let's look at the spending side of the equation. Expenditure on Welfare and Unemployment benefits are +£296/cap or 8% higher in Scotland than rUK. Given unemployment rates are almost identical this is presumably largely a function of greater levels of in-work-poverty in Scotland. This topic (in particular with respect to the National Minimum Wage level) is one I hope to return to. Health expenditure is +£190/cap or 10% higher in Scotland than rUK. I haven't investigated this further but factors here will include the fact that the Scottish NHS is fully devolved, free prescriptions are given and (I think) the Scots are simply on average less healthy than those in rUK. The significantly higher alcohol and tobacco consumption implied by the duty figures above must be a factor here. Education spend is +£75/cap or 5% higher - presumably largely due to the abolition of tuition fees in Scotland. Wiser heads than mind are grappling with the question of whether or not the Scottish education system is delivering a better education to all as a result of this. Transport spend is +£240/cap or 85% higher as a result of lower population density and remote Scottish communities. This factor is rarely acknowledged when people complain about high profile transportation infrastructure investments in the rest of the UK. Public Order & Safety (i.e. Police) spending is -£19/cap or 4% lower in Scotland than rUK. Other areas which can be broadly defined as "social expenditure" are all materially higher than rUK. Across Public & Common Services, Environment Protection, Housing & Community Amenities and Recreation, Culture and Religion Scotland spends +£396 or 57% more than rUK. I must confess this figure intrigues me. Expenditure on Enterprise and Economic Development is +£125/cap or nearly three times that in rUK. 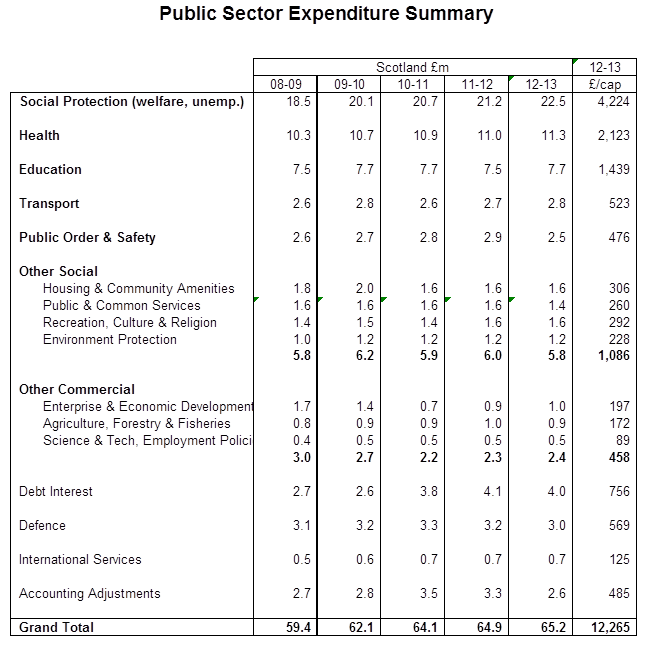 Agriculture, Forestry and Fisheries expenditure is +97/cap or more than double that of rUK. International Services and Defence are allocated on a per capita basis already (and Full Fiscal Autonomy is normal interpreted as everything except foreign relations and defence - so the GERS figure are consistent with that principle). It is worth noting that Public Sector Debt Interest is already allocated on a per capita basis in the GERS figures. This is consistent with Scotland having a per capita responsibility for the UK debt (which was widely accepted as the fair basis for allocation during Independence discussions). This should be remembered when the likes of Ms Sturgeon make wild statements about Scotland "putting in more than we get back" from the the UK. This statement is normally justified with dodgy comparisons of percent of tax raised with percent of spending received. The main flaw in this logic is that if you gave Scotland the same share of UK expenditure as it's share of UK revenue, Scotland would be responsible for its revenue share (not population share) of debt. It's also worth noting that even on this flawed basis of comparison, in fact in 2012-13 Scotland was responsible for 9.16% of revenue raised and received 9.29% of expenditure. So when you add all of that up we actually spend +£1,382/cap or 13% more than rUK. Of course this higher spend more than offsets the higher Revenue we generate due to North Sea Oil such that the Scottish deficit is +£512/cap worse than rUK in 2012-13. In absolute terms that means we need to find about £2.7bn simply to be no worse off than the rest of the UK. The higher Scottish spend/cap figure has been remarkably consistent over the last five years (ranging between £1,225 and £1,438). Now may be a good time to remind ourselves that in 2014-15 we are likely to have a Revenue advantage over rUK of only maybe £250/cap - so we can expect to see a deficit difference to rUK of nearly +£1,100/cap. Let's pause and think about that for a moment. If we tax and spend as we do today the accounts for a fully fiscally autonomous Scotland are likely to show that - for every man, woman and child in Scotland - we would be £1,100 a year worse off than if we continue to pool our lot with the UK. Something would have to be done. Tax take would need to go up or public expenditure would need to be reduced. These are the economic realities from which we can't hide. Of course economic growth would help but it's hard to imagine how or why a fiscally independent Scotland would miraculously create growth (or how long it would take before it materially affected the deficit). We already spend a relatively high amount on Enterprise and Economic Development as well as Agriculture, Forestry and Fisheries - and it's worth remembering that EU rules constrain the level of government support that can be given to industry. Now whether or not Scotland is fully fiscally autonomous (or indeed independent) the economic challenges we face are clear (and largely shared with rUK). To put absolute numbers against this - the GERS deficit for Scotland in 2012-13 was £12.1bn and the Oil & Gas revenues in 2014-15 are likely to be another £3.2bn lower giving us roughly a £15.3bn deficit problem to address. The graphic below (a work in progress) attempts to put the sources of revenue (in Green) and areas of Expenditure (in Red) is some kind of relative context. All you have to do (given we know the oil & gas number is now much lower) is work out how you might find £15.3bn through higher taxes or lower expenditure to eliminate the deficit. If that defeats you - on the basis that we appear set on devolving away Barnett benefits and driving to full fiscal autonomy - try and find £6.0bn or so to make us at least no worse off than being within the UK. Please drop me a line when you've worked it out. Here is how the absolute Scottish figures have shifted over the last five years, which may be helpful in considering what it takes to move these numbers by £6.4bn (to be no worse off than the UK is now) or £15bn+ to eliminate our likely deficit right now. There are also a surprising number of commentators who appear to get very confused about percentages and some - I'm looking at you "Wings over Scotland" - who don't seem to realise that we ran a large deficit in 2012-13 and that it was worse than the rest of the UK on any measure ... and that this was true before we factor in the known £3bn+ subsequent loss of North Sea oil revenues. Others have highlighted how these figures compare to OECD international comparisons - I think this is because those figures are current account balances (i.e. before capital investment or consumption). 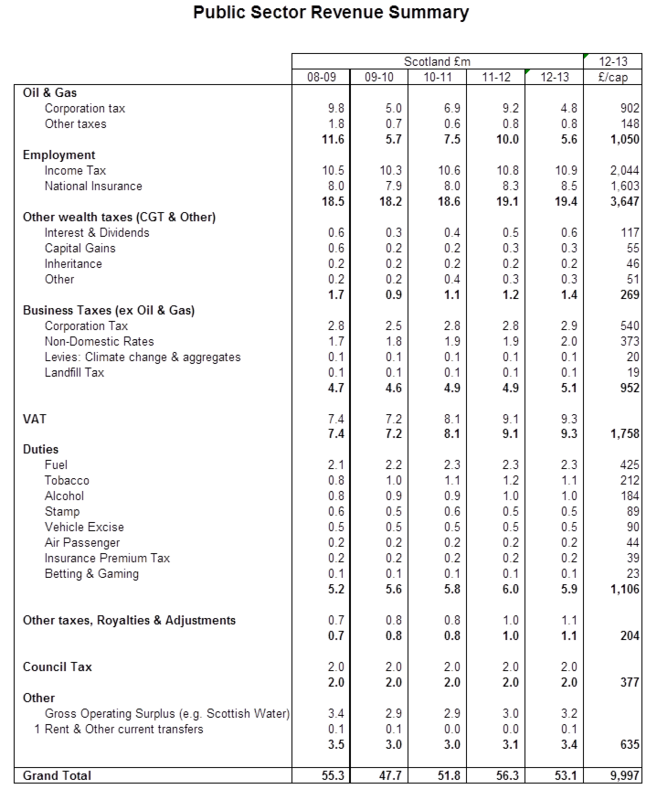 To save time in debates and on Twitter I have created the following table which I believe comprehensively summarises all of the different deficit figures over the last five years for Scotland, UK (and by implication) "rest of UK".